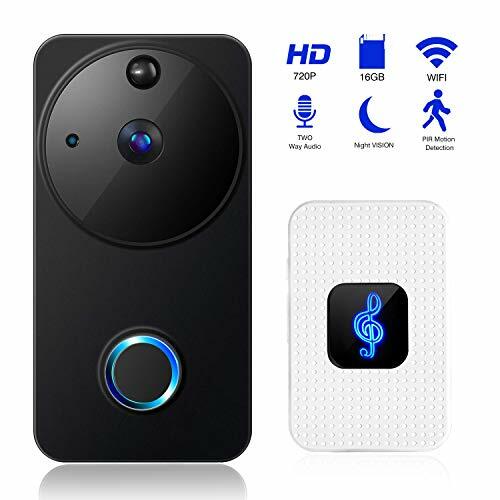 - 【IR Night Vision & Smart Motion Detection】:720 HD pixels collocated with 166°wide-angles lens.IR Night Vision which allows you to see clearly in a dark environment at a distance. It provides the protection you need at night and acts as a deterrent against to crimes such as theft and vandalism.Smart PIR motion detection, whenever any motion is detected,the doorbell camera sends alert to your mobile phone.The sensitive time is adjustable. - 【True Wireless & Standby Long Times】: No wires and cables are required, Equipped with two high capacity 18650 rechargeable battery,just download the APP, then connect it to your doorbell, you can have access to your family's surroundings at any time from your cellphone.Adopt ultra low power technology,generally, two batteries working 10 times every day can be used for 3-6 months, standby time more than 6 months. - 【Two-Way Audio & Loop Recording】: Two-Way Audio with Noise Canceling,allows you to talk to your visitors wherever you are. And you can watch real time videos on cellphone. Unique remote wake-up, doorbell let you don't miss any visitors and secure your home day and night. - 【16G Memory Card & Family Sharing】: 16G capacity storage,Save and keep for 30 days. Meanwhile,you could capture the photos or video clips at anytime and store in your phone or TF card.It also automatically covers the expired video files,easy to manage the monitoring records.There's no limit to access to the doorbell with smart phone, so you could set whole family members to monitor your home. - 【Easy to set up】: pair with your mobile by connecting Wi-Fi, compatible with iOS and Android.Please note: The doorbell is available for the 5V1A USB charger. When charging, you can check the charging status on the applicatio.Please confirm YINXN brand, and our store name Num1, if customer who place an doorbell from other stores, we cannot guarantee the quality of goods purchased from other stores.